How many times have you wanted a picture that showed how all the tables in your app were related? Note: This view is only available to roles with Full Administration access to the app. Under Advanced Features, click App management. Expand the Show App Info section, if necessary. 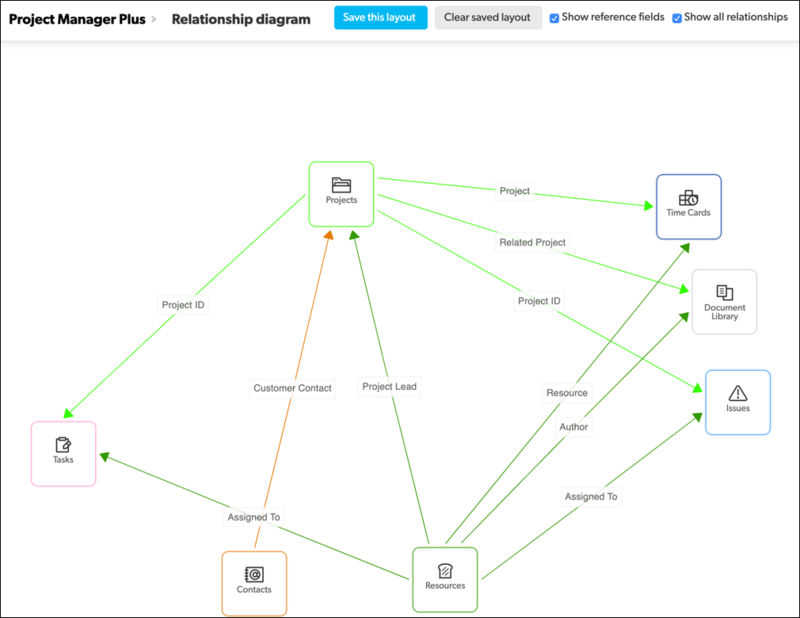 Each table in the app is shown here with its icon, and relationships to and from that table are shown as arrows. The reference field for the relationship is shown on the arrow. Tip: For those of you who would like to put this view on an app home page (for example), the URL to display the diagram looks like https://target_domain/db/app_dbid?a=reldiagram. Substitute your Quick Base domain name for target_domain, and the app identifier for app_dbid. Click and drag a table in the diagram to move it to a different place on the page. Once you have rearranged the diagram to your liking, click Save this layout. If you return to the relationship diagram for this app, it will display as you have saved it. If you don't like the layout, click Clear saved layout and refresh the page. Click a table in the relationship diagram. Information about the table appears in a dialog. Drag the dialog by its title bar to move it if needed. The dialog will appear in this position (even if you close and reopen it) until you drag it to a new location. Click the x in the upper right corner of the dialog to close it. Click the ## fields link in the info dialog to show the list of fields in that table. Hover your mouse over the reference field. Information about the relationship displays. If you have large numbers of tables or relationships in your app, you may want to hide parts of the diagram in order to better understand it. Hide reference fields by un-selecting the Show reference fields checkbox on the table bar. Re-select the checkbox to show the reference fields. Hide all relationships by un-selecting the Show all relationships checkbox on the table bar. Re-select the checkbox to show the relationship arrows. Hide relationships for a specific table by clicking that table in the diagram, then un-selecting the Show relationships for this table checkbox in the info dialog. Re-select the checkbox to show the relationship arrows for this table.